Made Here, a project of Hennepin Theatre Trust, is accepting artists’ submissions for its upcoming Spring/Summer 2017 Showcase exhibition. Each selected Made Here artist will receive $500, professional installation support, networking opportunities and more. The Made Here Showcases temporarily fill empty storefronts and commercial spaces that are in transition with art by local artists, turning the WeDo™ MPLS Cultural District into a walkable urban art gallery. 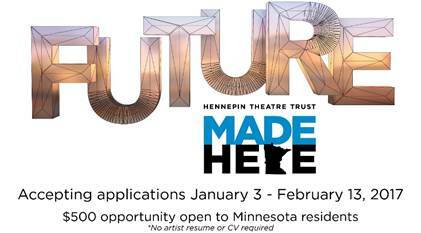 The Public Art & Placemaking team at Hennepin Theatre Trust will host a number of information sessions on applying for Future: Made Here, featuring a presentation of successful submissions from past projects, an opportunity to look through the application materials and time for questions to Made Here panelists who curate the project. Light snacks and beverages will be provided. All sessions are free and open to the public. You are encouraged to send this open call to your networks; the goal is to give this application opportunity to as many artists as possible! In the interest of accessibility and inclusivity artist statements, resumes or exhibition histories are not required to apply. Their panel curates each open call blind, meaning that panelists review the art without knowledge of artist names in an effort to produce unbiased outcomes. To be eligible to participate in the Made Here project all artists and artist groups must be residents of Minnesota. Made Here features artists who have never exhibited work as well as internationally renowned professionals. Made Here also works hard to feature artists representing diverse communities. On average, 40 percent of the artists are from communities of color. Balanced gender representation is a priority, as well as including seniors, children, artists with disabilities, GLBT artists and artists from Greater Minnesota. For artists in Greater Minnesota that are selected for Future: Made Here, a hotel room will be available to aid in the travel expenses and time needed to install. Special thanks to Andersen Windows for being the presenting sponsor of Made Here. Additional sponsorship support is provided by Le Meridien Chambers Hotel.